The Perks of Being a Wallflower wasn’t exactly a box office hit but it is one of those movies that slowly gains a devoted following. When it first came out, I remembered my high school friends raving about how meaningful the book was to them. I just had to give it a try. Charlie’s best friend has committed suicide, leaving him to experience his first days of high school confused and alone. Most of his peers are heartless jerks and don’t care about Charlie’s friend. Fortunately, he gets pulled into a really lovable group of friends who don’t buy into the superficial attitudes of typical high school students. These friends are drama nerds and soon-to-be ivy league scholars who know how to have a good time without hurting the people they love. They’re outcasts like Charlie, but they’ve embraced it, and they show him that there is a place for him even though he’s different. 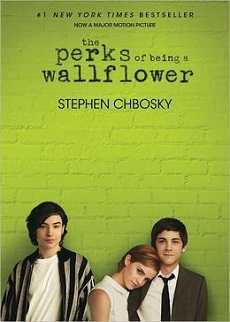 Chbosky manages to portray the unique kinship between these friends with originality and an honest sensibility. The only drawback is the fifth grade tone of the narration, which clashes oddly with the adult situations Charlie encounters. This made it hard for me to believe that Charlie was a gifted honors student in his freshman year of high school, and I almost stopped reading for that reason. Fortunately, there are perhaps four sentences in the first hundred pages that define the beautiful idea of the story which kept me plowing through the rest of the book’s overly simplified writing. On the other hand, I guess there’s nothing wrong with simplicity. One might say it is aesthetically useful in Charlie’s story because it gradually guides the reader through his loss of innocence which is filled with one dramatic event after another. Since Charlie is somewhat desensitized by his own emotional baggage, it is not an overwhelming read until the final event of the book. At that point, suddenly everything makes sense. There is a reason why everything is so simply put, and one might say it contributes to the essence of the story. Charlie which are incredibly unique to this genre of fiction, even outweighing the qualities of Holden Caulfield in Catcher in the Rye, which is an obvious influence to this book. That is not to say that the book itself is comparable to Catcher in the Rye. With Catcher in the Rye, it is actually believable that the narrator is in high school because his witty judgement on his world is honestly immature, hypocritical and human in a very relatable way. Charlie, who is more sensitive, doesn’t complain or pretend to hate everyone, and would never do the dramatically impulsive things Holden did. Charlie accepts people for who they are and clearly wants to become an adult in the most genuine way, which for me, makes it hard to see him as a believable character. Nevertheless, Charlie is not just some Holden Caulfield wanna-be. He paves the way as a remarkable person who anyone would want to be friends with, and that makes this book worth reading. I wouldn’t recommend Perks to readers of coming of age American literature because anyone who read Catcher in the Rye and similar stories will expect more out of this book than it has to offer and miss out on what lies beneath the mediocre writing. Perhaps see the movie first, which highlights the parts that are worth reading and gets rid of the rest of the babble. Chbosky, who also directed and wrote the screenplay of the movie version of this book, is a better screenwriter than a novelist by far. Screenwriting is what he went to college for, after all. that young people deal with – drug use, sexuality, relationships, violence, and self-discovery, while engaging in good music and showing readers a taste of what it means to be a real friend. Though I didn’t thoroughly enjoy the process of reading this book, I definitely learned something from it and will remember it. Sasha Abe is a college graduate who loves to write and appreciates works of literature and film that break free from social norms.